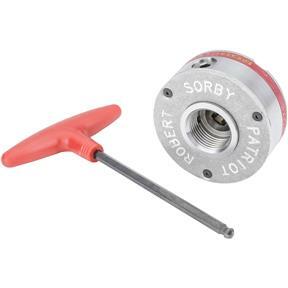 The Patriot Lathe Chuck from Robert Sorby has all the features turners look for in a scroll chuck. The compact design does not strain lathe bearings and the insert system allows it to fit almost every lathe. All jaws are perfectly matched so no need for tiresome number matching. Single key operation requires only the lightest of touches and the key is articulated to allow access behind large projects. 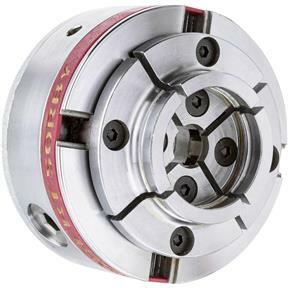 Kaw stops prevent slides from working loose and wide selection of useful jaws gives this chuck additional versatility. The jaws are dovetailed on the inside and outside face and additional serrated teeth give it that extra grip, while the enclosed back protects gearing against dust. Backplate is removable for easy maintenance and cleaning. Comes complete with 2" jaws and woodscrew. Excellent Chuck, very well made, works great bought the pin jaws as well ...so nice to receive a great product like this Thanks !!! !